So it’s your first Mardi Gras. Congratulations! Not only does this mean that you’ve survived a pretty significant chunk of your freshman year, it means that you’re about to witness McNicholas tradition in action, with all its pageantry, grandeur, sore feet, and awkward slow dances included. 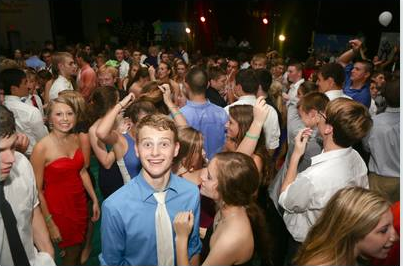 This isn’t just any high school dance. Here at McNick, it’s a rite of passage. With the big night less than a week away, you’ve probably got some questions. Why do we celebrate Mardi Gras? Is this going to be anything like what they do in New Orleans? Where does one buy a corsage? How do you pronounce ‘boutonniere’? To help clear up some of the confusion and provide a little extra insight into the evening, here are a few tips for Mardi Gras first-timers, handed down from a couple of seasoned veterans. Consider it The Milestone’s Declassified Mardi Gras Survival Guide, if you catch my drift. Do: Utilize the coat check! Here’s the thing about Mardi Gras – it’s a lot of people in the same room for a very lengthy amount of time. Translation: it gets hot. Even in the frigid middle of February. If you’re a guy who’s wearing a suit jacket or sport-coat (which you should, at least for the ceremony), make sure to stop by the coat check, located at the end of the main office hallway, to keep your jacket in check for the evening. Ladies are also encouraged to stop by the coat check to drop off jackets and stow their purses, cell phones, and other valuables in a safe place. Don’t be the one who starts clapping in the dead silence, just as a court member is making her way to the stage. If there’s one way to ruin the moment for a member of the court, it’s someone in the audience making a scene during their procession. So please, hold your applause until the court member bows/curtsies to the audience. During the Grand March, when the couples make their way around to greet audience members, stay seated, but wait until the bow/curtsy before you start clapping. When the king and queen make their way to your section, make sure you stand and recognize them as well – trust me, they deserve it. Okay, so here’s the deal: unless you’re a family member or a call-out for someone on the court, you’re going to be sitting on the bleachers during the ceremony. I’ll let you in on a little secret. Go for either the very top row of seats, or try to nab a spot along the right or left walls of the main bleachers. If you don’t, there’s like a 90% chance you’re going to end up having to awkwardly lean on the person behind you, or else end up with an aching back before the dance even starts. But you’re going to have to get there early – once the doors open, everybody runs for the coveted wall-seats and it basically turns into the Hunger Games. When you decide to text your friends or check Twitter during the ceremony, it’s not just annoying to the people around you; it’s downright disrespectful to the community and especially to the members of the court. Remember – the real reason for Mardi Gras isn’t the dance. The main focus of the night surrounds the service and the commitment of the members of the senior court and the sophomore and junior Honor Guards. No matter how desperate you may be to scroll through Tumblr to pass the time, please refrain from doing so. We all thank you. Seriously. This is why we specifically aren’t allowed to play “Sandstorm” anymore. Sure, it’s fun to go nuts for about twelve seconds – until you get kneed in the face by the kid who decides that crowd surfing is something that people do at high school dances and the teacher-chaperones have to move in and start pulling people apart. And yes, people actually have gotten hurt because people go too hard at Mardi Gras. Save the moshing for Warped Tour or Bunbury or wherever you crazy kids go these days. Please, for the love of all that is good and holy, when you decide to ditch your six-inch heels before heading out to the dance floor, don’t just throw them in one of Losekamp’s plants. Instead, if you decide you simply can’t go on standing, neatly line your shoes along the office hallway. Emphasis on neatly. Odds are, somebody else has a pair of shoes that look just like yours, and when three hundred girls are all crammed into the same hallway, searching through a pile of mismatched heels at the end of the night, things get crazy. This is pretty much the biggest Mardi Gras faux pas you can possibly make. Yes, we know the ceremony is long. To be honest, it usually seems to clock in at around 1 to 1.5 hours. But the pageant is literally the point of the entire evening; without it, there is no Mardi Gras – there’s just a dance. If you’re not convinced, you should probably know that they won’t let you in after the pageant begins and you’ll miss the pageant and the dance. So really, your only choice is to be there on time for the ceremony, or don’t bother going at all and consider the $15 you spent on a ticket as a donation to McNick.